Lowdown: A group of teen Aussies form a resistance when their country is occupied. 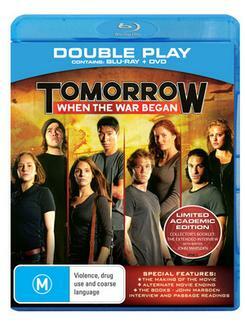 Tomorrow, When the War Began was reputed to be a sensational hit at Aussie cinemas and later on DVD & Co. I was curious to see what the fuss is all about. The fuss turned out to be a film about teens and for teens. We follow a group of your typical Aussie teens, at least as far as general demographics are concerened: most of them are Anglos, with a token Greek and Asian; half are female and half are male; all are good looking. Surprisingly good looking: they look like they just came out of the shower even after a week in the outback. The first act has us falling for these young and pure of hearts. We watch them chop wood for the fire and occupy themselves in your typical Aussie outdoor activities that anyone looking like they just came out of the shower in this age of PlayStations is bound to take part in most of the time [not!]. Especially when considering the majority of Aussies live in cities. Our heroes go on this expedition to the outback that leaves them disconnected from the rest of the world for a while. When they come back they discover the world they left behind is no longer there: Australia was occupied by a vicious invading force that's left unnamed but is obviously of Asian nature. Thus our group of teens are thrown into a world where everything they took for granted is gone, adults included. Our heroes will not surrender, though. They form a resistance and start their guerrilla war campaign. However, most of their attention seems to be spent/wasted on their teen anxieties: we have this good looking model material girl who cannot find a guy to ask her out, we have couples and would be couples dealing with all the tension that comes with teen relationships, etc. The way the film is structured it seems like our heroes always arrive to the peak of their relationship stress just when enemy soldiers are at the door or at the very minute they are about to embark on a counter attack. No worries, though: the enemy always waits for them to finish their squabbling first. Tomorrow, When the War Began looks good for an action film. For an Australian film in particular, given its obvious shortage of budget when compared to equivalent American releases, this is quite an achievement. The enemy helicopter gunship, for example, is revealed - through glimpses - to be a tiny cheap helicopter; the enemy buggies look like they were handmade. But it works and production values turn the film into an acceptable one; pity the film itself doesn't, with too many things not making sense. For example, can we really expect the army that conquered Australia overnight to lack night vision facilities, thus allowing our kids to terrorize them? Besides, those soldiers are pretty bad at soldiering. One can only conclude the film is trying to tell us they are so useless because they are Asians. Which leads me to my main criticism towards Tomorrow, When the War Began. I can understand the need for silly films and I can understand the need to camouflage a film about teenage angst through the guise of an action flick. What I don't understand is the way the film endorses that xenophobic world view that is so dominant in contemporary Australia, the one that has us regarding refugees arriving on boats to Australian shores as if they were criminals and the one that makes us think Australia is better than the rest of the world. By depicting the enemy as the nameless Asian and by contrasting them with the gold plated Aussie whose land is being invaded the analogy to the prevailing but stupid notion of "the world out there wants to steal our spoils" gets further nourished. We have too much of that already; we need to get rid of it, not enhance it. Worst scene: The daughter of the vicar won't fire on enemy soldiers because she is a believer and the bible says thou shall not kill. How stupid is that? The bible I read us God & Co killing all over the place. From Noah through Joshua and beyond, the bible is one long killing fest. How dumb can you be to disregards that? And why seek to dumb down the typical teen Aussie viewer that's probably quite ignorant in the ways of the bible even further? Technical assessment: The picture on this Blu-ray is pretty good. The sound is not of the same quality, but still - this is the best Aussie Blu-ray I have seen other than Australia. Overall: Sorry, but this one is pretty dumb. 1.5 out of 5 stars.